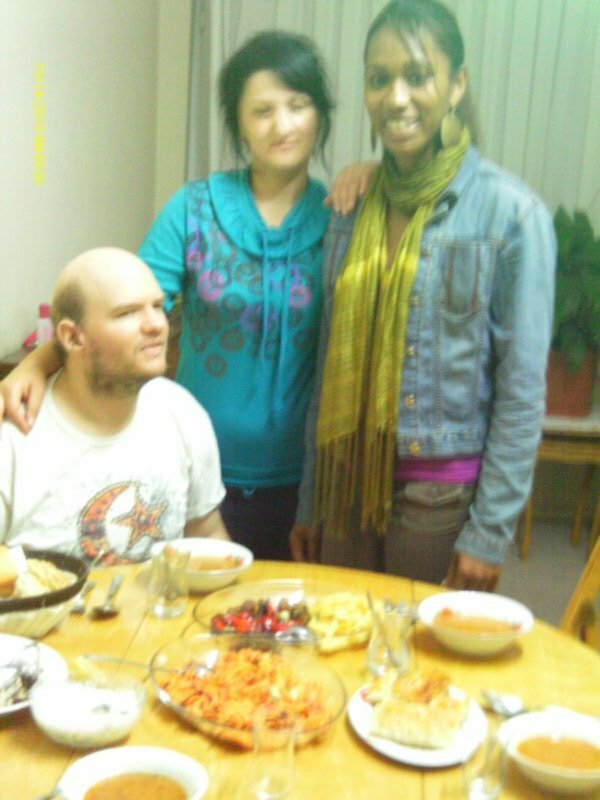 Tony and Tatsinda from California and three local Turkish girls in their late teens. 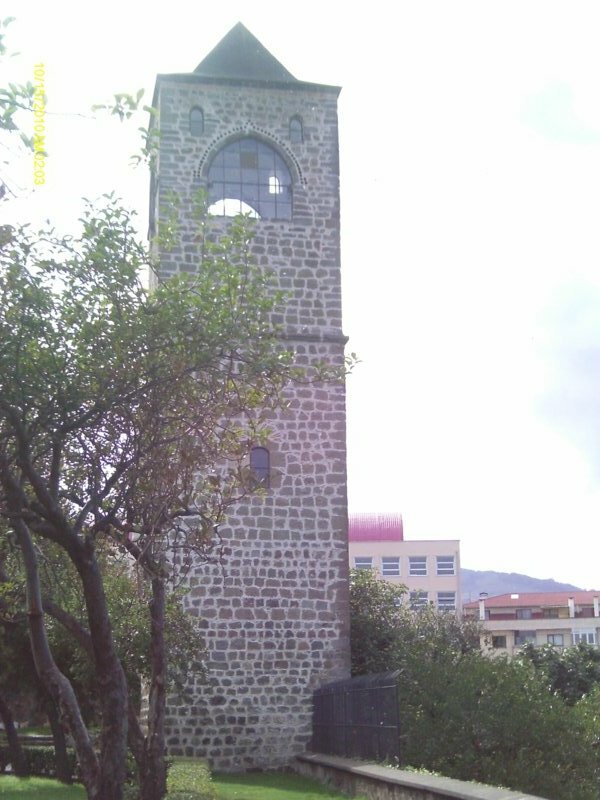 Taken in Trabzon centre in the late afternoon. 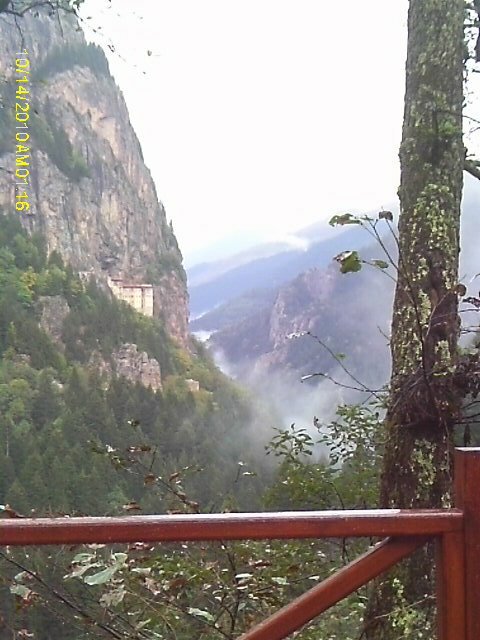 View along the misty Altındere valley on the walk up to Sumela Monastery. 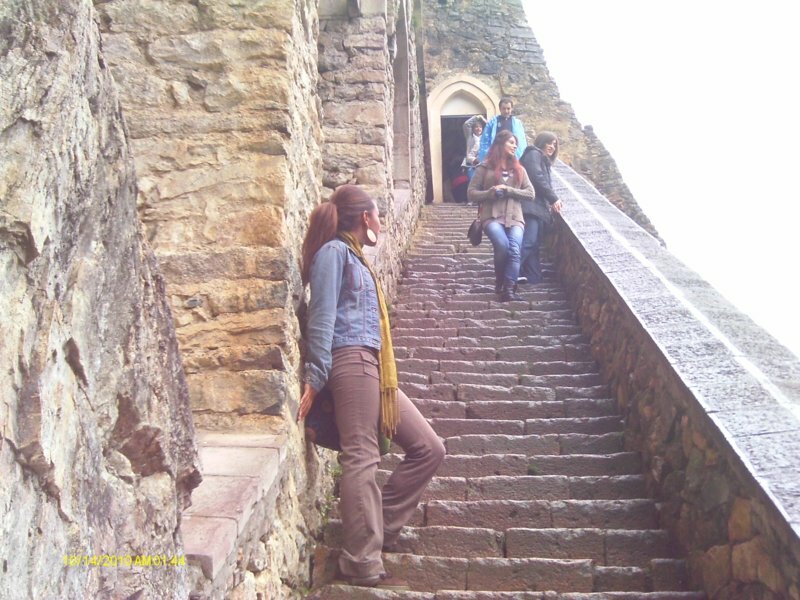 There is a long walk by a river up many rocky steps to the monastery, which is on a ledge on top a steep cliff, on Melá mountain. Sumela Monastery of the Virgin Mary is located near Trabzon (Trebizond), on Turkey’s Black Sea coast. The Greek orthodox monastery, founded in the year 386 AD, stands at the foot of a steep cliff facing the Altındere valley. 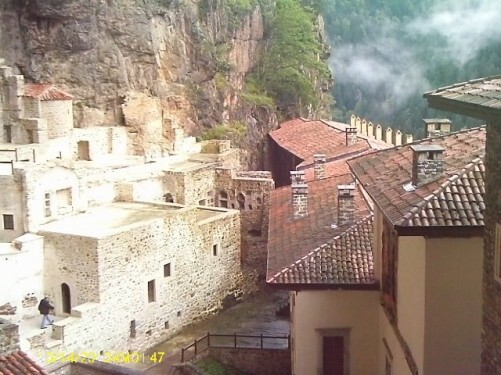 The monastery has been ruined and rebuilt several times over the centuries. 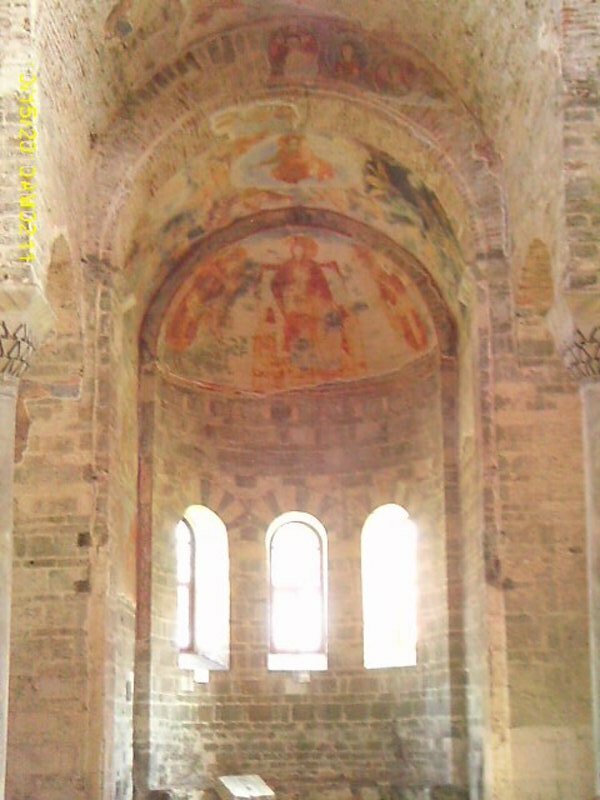 Its present form dates from the 13th century. 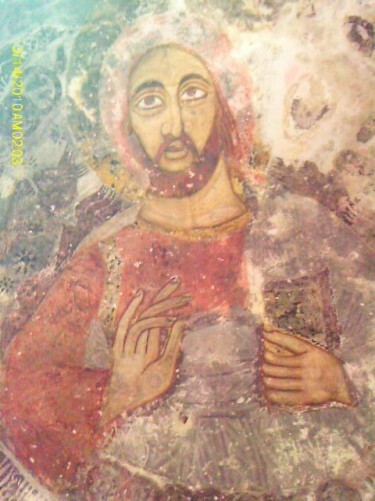 The most important structure is the rock church and a sacred spring. 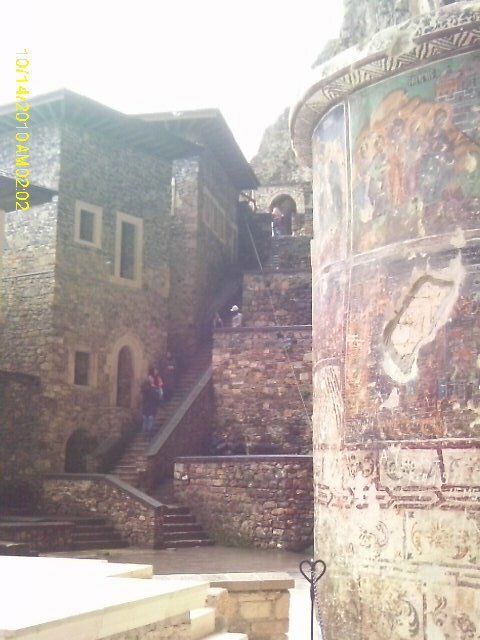 Steps up to an entrance into Sumela Monastery. 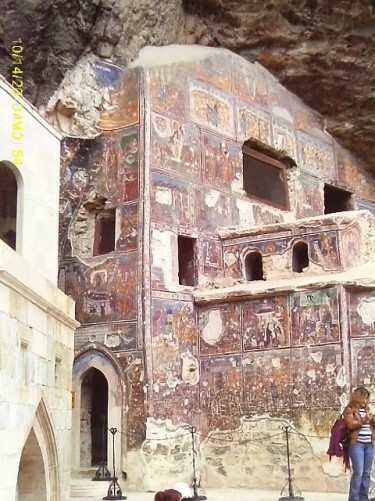 The Rock Church at Sumela Monastery built into a cliff with painted exterior walls. Fresco inside the Rock Church. View of the Rock Church and steps at Sumela Monastery. 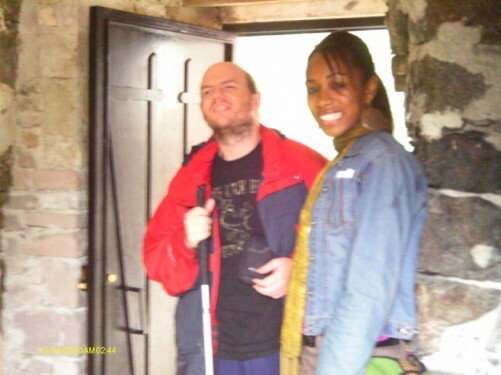 Tony and Tatsinda at Sumela Monastery. Tony and Tatsinda on steps outside The Ataturk mansion. 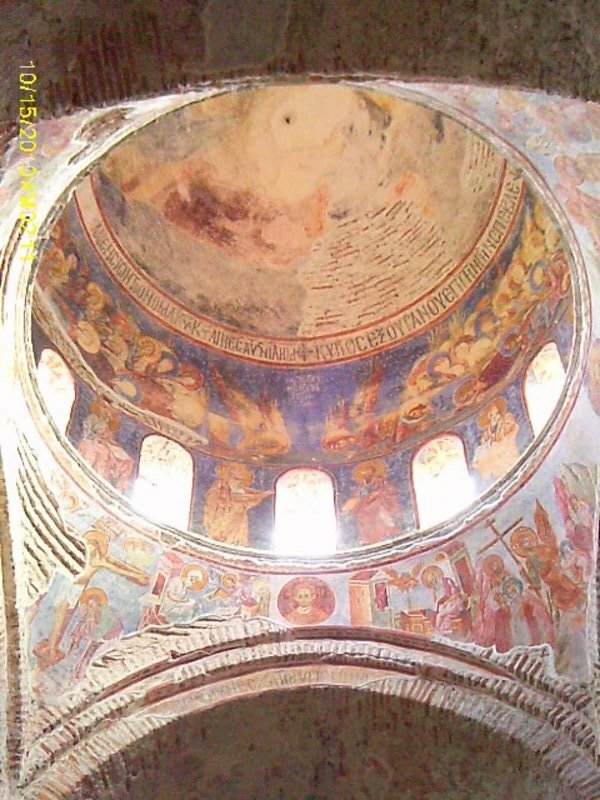 It was built by a wealthy Greek Banker, Konstantinos Kappagianidis. Ataturk stayed their twice in the 1930s. 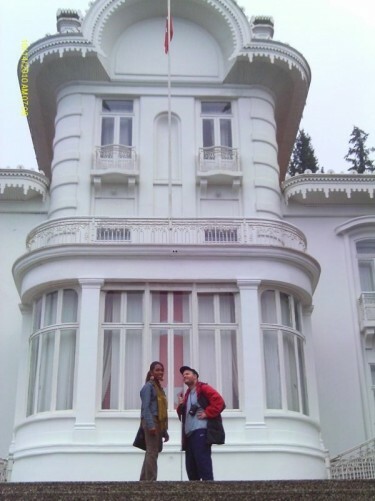 Tony and Tatsinda outside the Ataturk mansion. Tony and Tatsinda at a typical Turkish student house in Trabzon. Enjoying local hospitality with the three local girls we met. Tony, Tatsinda outside the 13th century Hagia Sophia church in Trabzon city centre. It means “Holy Wisdom” in Greek, is a former Greek orthodox church and now the Hagia Sophia Museum. 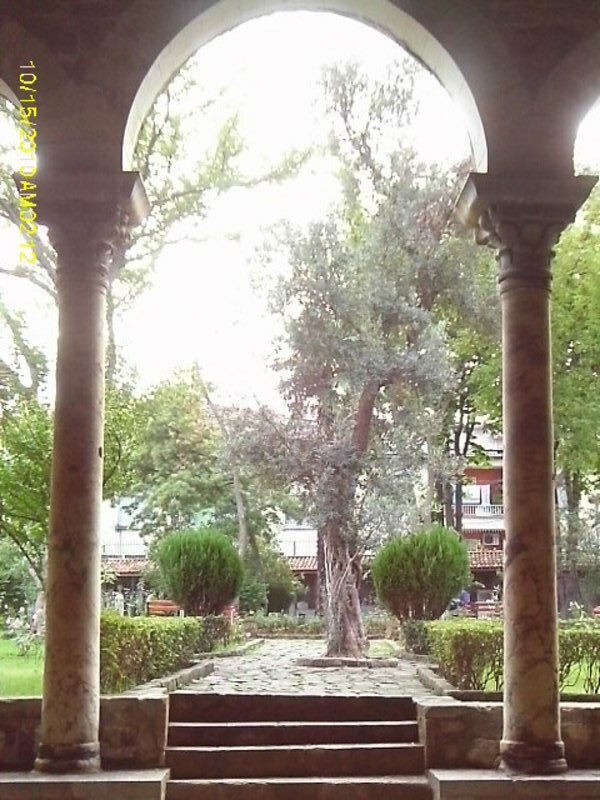 The building is of late Byzantine architecture. The church was converted into a mosque in the 15th century and turned into a museum in the early 1960s. The Hagia Sophia church is an important example of late Byzantine architecture, being characterised by a high central dome and four large column arches supporting the weight of the dome and ceiling. 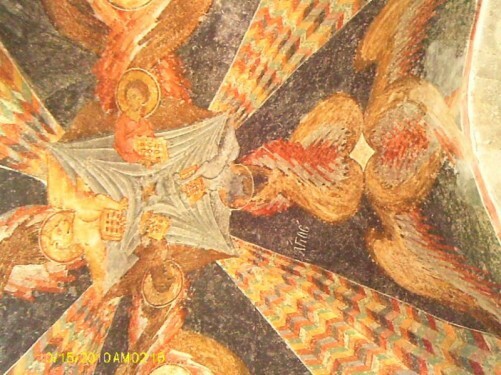 Below the dome is an Opus sectile pavement of multi-coloured stones. The church was built with a cross-in-square plan, but with an exterior form in the shape of a cross thanks to prominent north and south porches. The structure is 22 metres long, 11.6 metres wide and 12.7 metres tall. The late 13th-century frescos, revealed during restoration, illustrate New Testament themes. 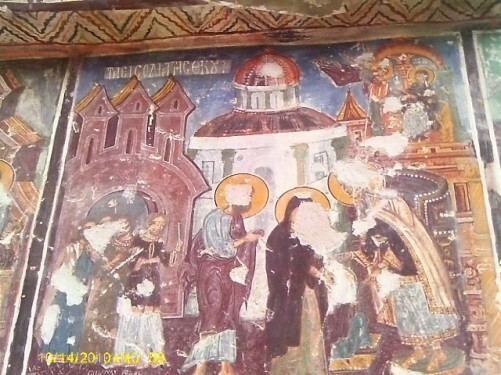 External stone figurative reliefs and other ornamenting is in keeping with local traditions found in Georgia and Armenia. Bell tower of Hagia Sophia church, Trabzon. 24 metres to the west of the church, the bell tower, built 1425, is 40 metres high and also contains frescoes. Byzantine painted frescos inside the church. 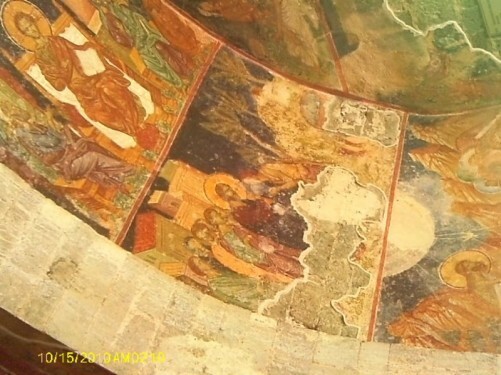 The high central dome of Hagia Sophia church. 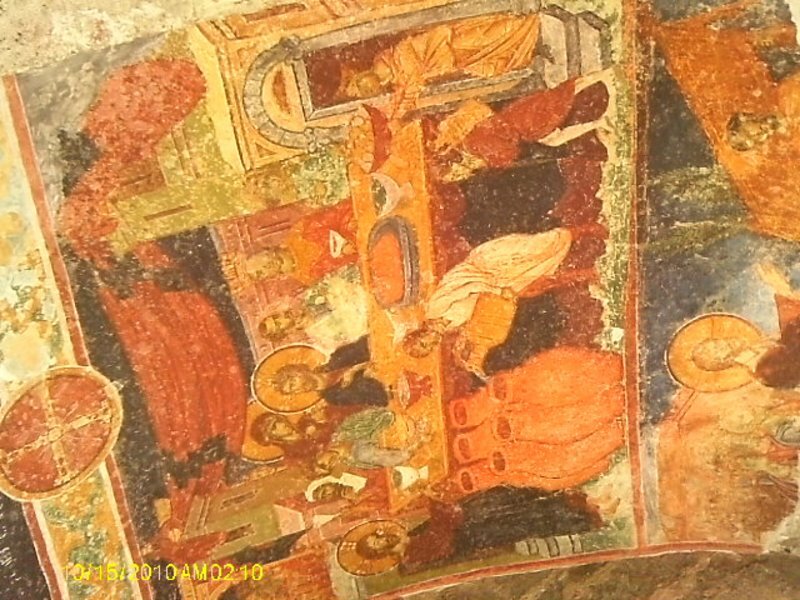 Painted with frescos. Church garden viewed through one of the church arches. 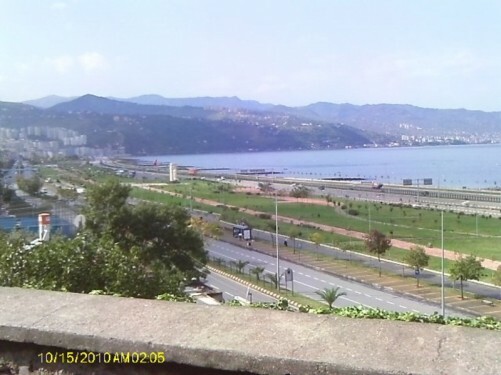 A view of the nearby coastline and Black Sea over one wall of the church grounds.